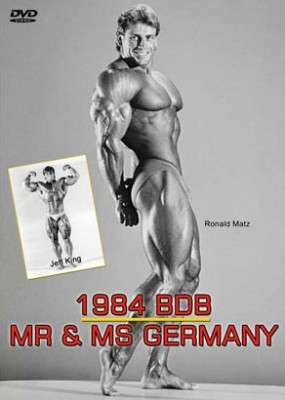 The 1984 BDB Mr Germany was won by Ronald Matz, who competed with distinction a number of times in the NABBA Universe.. The DVD includes many great physiques from Germany in the mid eighties. The BDB was the forerunner of NABBA Germany. Held in the Philips Hall, Dusseldorf, the 1984 BDB Mr Germany was won by Ronald Matz. The BDB was regarded as being the forerunner of NABBA Germany. Ronald Matz competed with distinction a number of times in the NABBA Universe. The DVD includes many great physiques from Germany in the mid eighties. The fantastic GUEST POSERS were: Jeff King, Lance Dreher, Franz Bach, Hermine Klinger and Gabriele Sievers. This is probably the best ever posing footage of JEFF KING, and he was immensely popular with the fans. “Star guest poser JEFF KING was in similar shape as shown in his winning photo below. He was simply incredible. In my opinion, he was in his best ever shape in 1984. 192 athletes (male and female) took part. The contest was held on the 12th of May 1984 in Düsseldorf’s “Philipshalle”. There were over 2500 spectators. The overall standard of the contest was very high. The 22 years old Ron Matz from Hamburg won the heavyweight class and became overall champion, defeating Edwin Rössler from Rheinstetten (winner of the short class) and Rüdiger Becker from Siegen (winner of the medium class). Ron Matz and Edwin Rössler were extremely massive and in ripped condition and fought it out like two bulls. Rüdiger Becker was not so massive but was perfectly symmetrical and in the best shape of his life. 7 judges to decide the Overall Champion. In the end Ron Matz got 3 votes and the others 2 got 2 votes each in the posedown. The highlight of the DVD for me was the awesome appearance of Jeff King. He looked like a God who had descended from Mount Olympus – he was truly awesome. Held in the Philips Hall, Dusseldorf, the 1984 BDB Mr Germany was won by Ronald Matz, see photo right. The DVD includes many great physiques from Germany in the mid eighties. The BDB was regarded as being the forerunner of NABBA Germany. Ronald Matz competed with distinction a number of times in the NABBA Universe.The fantastic GUEST POSERS were: Jeff King, Lance Dreher, Franz Bach, Hermine Klinger and Gabriele Sievers. This is probably the best ever posing footage of JEFF KING. SPECIAL THANKS: The Jeff King photo was taken shortly before this guest posing, and contest information, all supplied by Stefan Wichmann. GMV researcher – Germany. The 22 years old Ron Matz from Hamburg won the heavyweight class and became overall champion, defeating Edwin Rössler from Rheinstetten (winner of the short class) and Rüdiger Becker from Siegen (winner of the medium class).Ron Matz and Edwin Rössler were extremely massive and in ripped condition and fought it out like two bulls. Rüdiger Becker was not so massive but was perfectly symmetrical and in the best shape of his life. Concerning muscularity and condition, all three open class winners were very close together. This made it extremely difficult for the7 judges to decide the Overall Champion. In the end Ron Matz got 3 votes and the others 2 got 2 votes each in the posedown.